True to traditional Alaskan lodging, each room at the Inn has its own unique configuration. Find the one that is right for you and your party on our Lodging page, then give us a call or send us an email. Our intimate, wooded RV Park has full hook-ups and is open from mid-May to mid-September. It is beautiful, well-maintained, and has 18 wooded, full hook-up sites (9 are pull throughs), all with 30/50 amp service. We also have 13 dry campsites. In the center of the RV park is an outdoor pavilion with a fire pit for your enjoyment. Serving carefully crafted espresso, hand-dipped ice cream and milkshakes, breakfast, burgers, and more, our cafe is a great place for a hot snack or meal break. We even have complimentary Wi-Fi for our customers and guests. 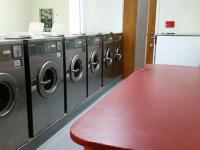 We have the area's largest public laundromat and shower facilities, both of which are open during business hours. 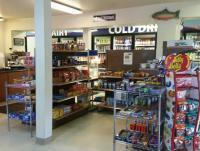 Our Store features an eclectic collection of Made in Alaska gifts, along with a wide variety of snacks, cold drinks, ice, RV and automotive supplies, pet products, health and beauty items, chargers and cables for electronics, and... .
As a special service for our lodging & RV guests, we can inquire about tours for you with the area's best tour operators. Open 24/7/365, our fuel pumps offer regular, mid-grade, premium, and diesel fuels. Whether for use in your RV or cabin, we have certified professionals who can fill any size bottles during business hours.